Theatre Is Easy | Reviews | That's My Moonbeam! What if you could escape this planet? 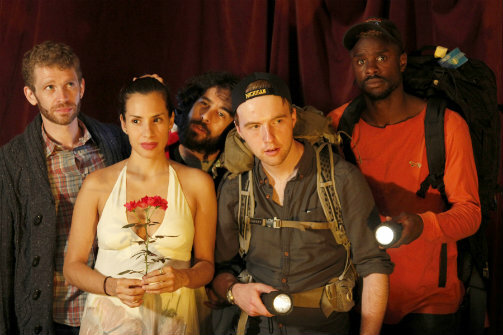 Billy Fenderson, Vanessa Morales, Dyalekt, Graham Techler, Ohene Cornelius in That's My Moonbeam. Photo by Jason Grimste. BOTTOM LINE: With a subtle hand and a big heart, That’s My Moonbeam! explores escapism. That’s My Moonbeam is for anyone who’s ever said, “I don’t want to live on this planet anymore.” This planet offers wonder and love, heartbreak and horror, in unpredictable proportions. The essential question—if you really could leave, would you go or stay?—drives this sweet play forward into something poignant and lasting. Trailer-dwelling couple Octavia (Vanessa Morales) and Phillip (Billy Fenderson) have faced real horrors together, and their response has been to drop everything and call for extraterrestrial assistance. Phillip’s all but standing with his thumb out; Octavia’s still healing. A drifter named Trip (Dyalekt) weaves his strange life around their peaceful one in the desert, and into the delicate mess stumble two Brooklynite weekenders, Isaac (Graham Techler) and Kurt (Ohene Cornelius). All the design aspects are well done, but the magic of the show is in its cast. Under Jeffrey Whitted's direction, every actor is generous with the rest, and this camaraderie carries the play's bouncy humor through the absurdity of waiting for the mother ship. In the end the characters subtly inspire a hope for humanity in each other—and in the audience—that makes the possibility of leaving Earth behind a real dilemma. That’s My Moonbeam is a lovely new play, full of joie de vivre, but as a new play, its structural integrity is tested by some awkward phrases and unearned emotional transitions (particularly by Octavia, whose conservative character is perhaps furthest from the playwright’s own experience). The first two-thirds of the play are strong—and there’s a heartbreaking scene between Kurt and Isaac, greater than the sum of its parts—but there’s a bit of a frenzy as the play struggles to wrap up all its loose ends in a timely manner. The play shines most when its characters have all the time in the world to weave their webs and share their world with each other, under the stars and whatever else is out there. That’s My Moonbeam! is written by Jason Grimste. Directed by Jeffrey Whitted. Lighting Design by Zach Murphy. Sound Design by Tim Boyce. Set Design by Sara Jo DeGennaro. Stage Manager is Abby Walsh. Original compositions by Lucas Cantor. Light Board Operator is Mark Brinker. The cast is Vanessa Morales, Billy Fenderson, Graham Techler, Ohene Cornelius, and Dyalekt.